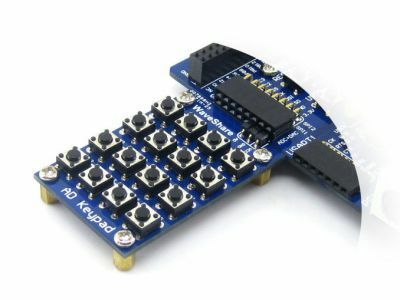 This board provides you the most ideal solution to add a keypad by using least number of I/O pins in your DIY projects. 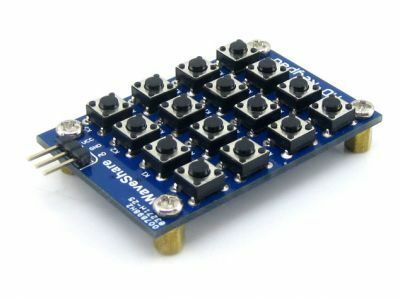 You can have 16 buttons ordered 4x4 by connecting this one analog voltage out board to one of ADC pins of your microcontroller. For example: When the board is operating with a 5 V Arduino board, if th button 8 is pressed, the output becomes Vo = (8/16) x 5 V = 2,5 V . If we give this voltage to one of the analog input pins of arduino, as the ADC modul of arduino is 10 bits, (2^10 = 1024) 2.5 / 5 x 1024 = 512 will be red. There is %6 error rate based on the tolerances of the resistors. 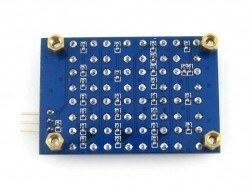 You may visit the Wiki page of the product for example code and the circuit schematics.